Im März haben wir den Wettbewerb « Tekoe-Weihnachtsbecher“ in allen unseren Geschäften organisiert. 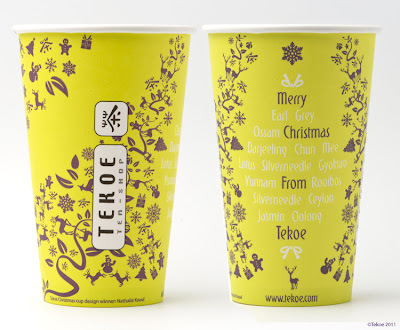 Jeder Teilnehmer hatte die Möglichkeit, den neuen Tekoe Becher für die kommende Weihnachtszeit zu kreieren. Sie können diese neuen Weihnachtsbecher ab sofort in allen unseren Filialen entdecken und wir möchten alle Teilnehmer des Wettbewerbs für Ihre Kreativität herzlich danken! Souvenez-vous en mars dernier, nous avions organisé un concours « À la recherche du nouveau gobelet Tekoe » à l’attention de graphistes en herbe ou confirmés : ces derniers ont pu laisser libre cours à leur créativité pour définir le nouveau visuel présent sur nos gobelets pour les Fêtes de fin d’année. Vous pouvez d’ores et déjà découvrir notre nouveau gobelet dans nos magasins et nous tenons à remercier vivement tous les designers amateurs ou professionnels qui ont accepté de participer à ce projet ! 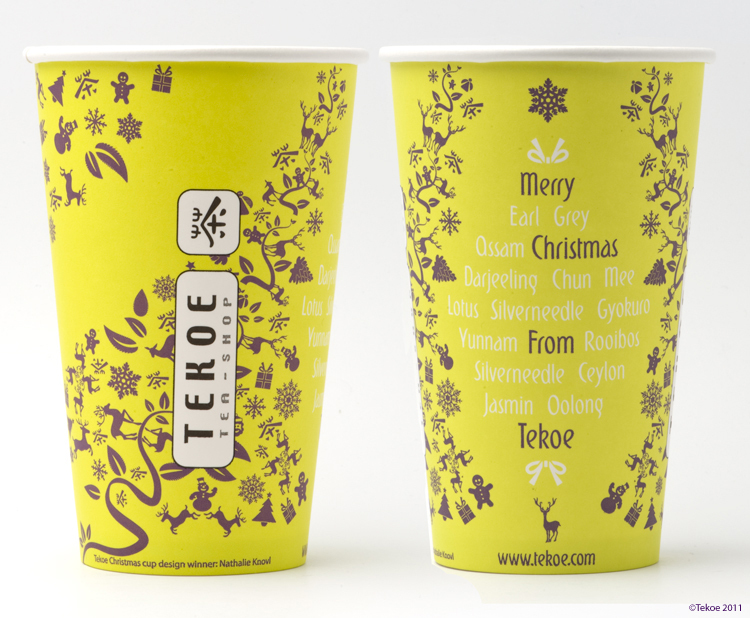 In March we held the "In Search of the new Tekoe cup" design competion open to the budding graphic designers or confirmed pros: they were able to unleash their creativity to define a new visual for our 2012 holiday cup. The quality and originality of the entries did not make selecting the winner an easy task. At the end it was designer Nathalie Knovl who won our vote - she managed to recreate a festive and joyful Christmas atmosphere while incorporating symbols related to tea. Nathalie, passionate about art and tea, explains that the creative experience was very rewarding. "I decided to design something young, bright, attractive and welcoming. Encouraging people to drink tea instead of drinking soft drinks or coffee on their way to work, can create positive changes...it is a good way to start the day, and it's also good for your health. " As to who are Nathalie's favoire artists/designers, her inspirations? Check out the French/Geraman section of this article for the complete list! You can already see the new cups in our stores, and we would like to thank all amateur and professional designers who entered in the contest!